Never tasted Szechuan peppercorns? 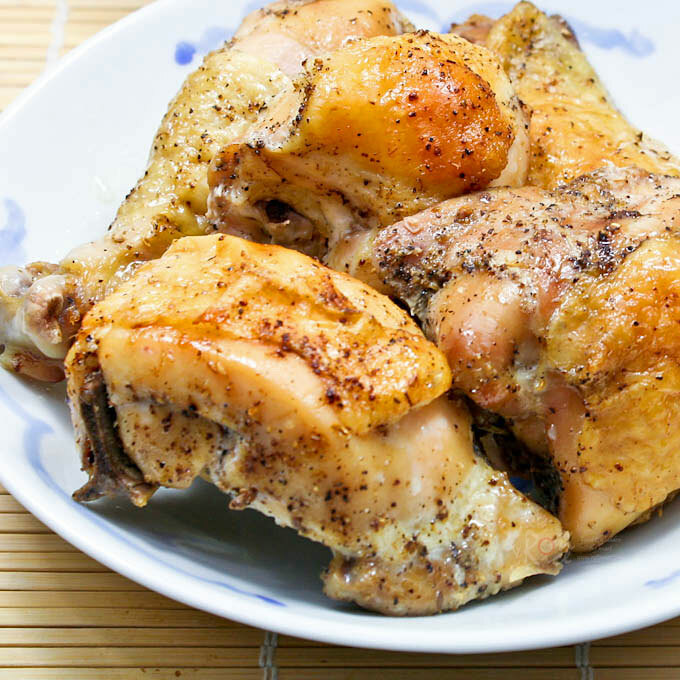 Try this fragrant and delicious Szechuan Pepper Roast Chicken with a slightly spicy bite. Uses only 5 ingredients. Some years back we had a family over for lunch and they brought a delicious chicken dish with a very interesting ingredient that was “new” to me. I did not realize then that this same ingredient is found in five-spice-powder. While I do use five-spice-powder every now and then, I have never used this particular spice on its own. I was intrigued. Known as Szechuan peppercorns, these brown berries are not peppercorns at all. They are berries from the prickly ash bush with a truly unique flavor. Biting into a berry releases a peppery taste with a hint of anise and lemony overtones, followed by a tingling and numbing sensation to the tongue. 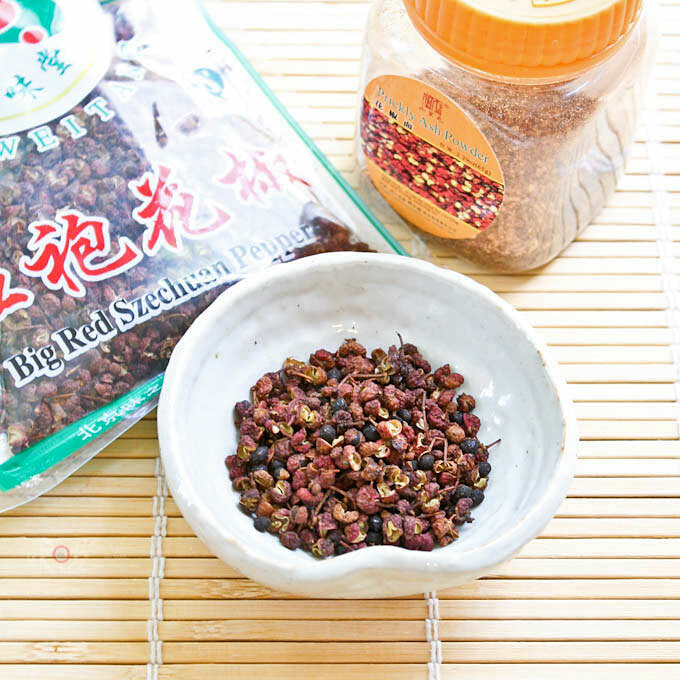 Also known as huājiāo, it is widely used in Szechuanese cuisine giving it that fiery flavor. In Japan, it is called sanshō and is usually sold ground. It appears a little more yellow in color and has a slightly milder flavor. Typically used on grilled foods like yakitori or eel, it is also one of the ingredients in shichimi togarashi. The fragrant serrated kinome leaves are used as a garnish. I used ready ground Szechuan pepper for this Szechuan Pepper Roast Chicken dish. Place chicken pieces in a large bowl. Sprinkle Szechuan pepper, salt, and pepper over chicken. Mix well and allow chicken to marinade for at least 30 minutes. Pre-heat oven to 375°F (190°C). 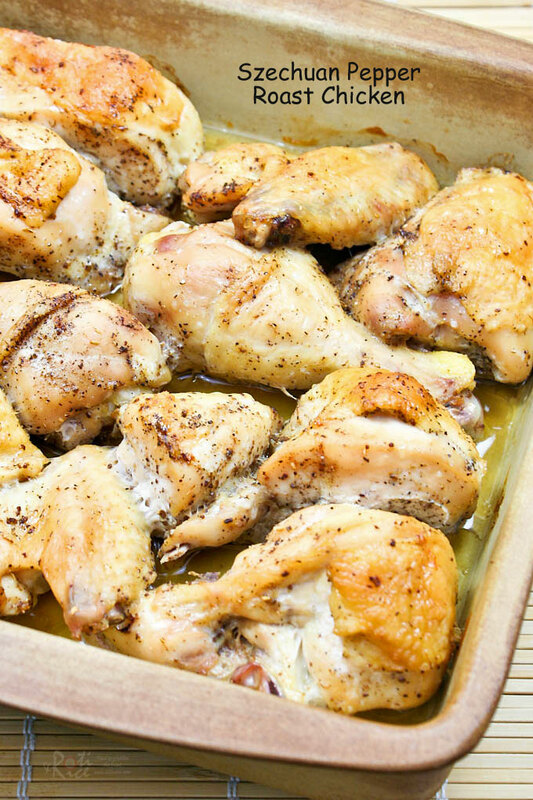 Arrange chicken pieces in a single layer on a large baking tray. Drizzle canola oil onto chicken pieces. Roast for 1 hour 15 minutes or until chicken is golden brown. Remove and leave to rest for 10 minutes before serving. **Please finely crush 2 teaspoon whole Szechuan peppercorns if preferred. I love Szechuan peppercorns. I love the citrus notes and heat it gives. Such a lovely chicken dish. Aww…thanks Patty for your kind words! Have a great weekend! That chicken looks so delicious!! Love the peppercorns. I love the peppercorns too. have a lovely weekend! Biren, this chicken looks fabulous! It’s new ingredient to me too, but we always love new spices to roast the chicken! Perfectly roasted chicken… Now it’s our lunch time and I wish I have this for lunch… Looks so good! I love chicken. Perfect recipe. Thanks Cristine! Have a great weekend! I need to pick up some of the peppers next time I am in Chinatown. This sounds great- so simple but seasoned with yummy flavors. Please do pick some up as they are good with pork as well. Enjoy your weekend! I love sansho on yakitori. This is a little like that except that the Szechuan peppercorns have a stronger flavor. Your chicken looks perfectly cooked, Biren! I’ll have to keep an eye out for the Szechuan pepper, I bet it adds great flavor to the dish! Thanks Faith! I hope you find the peppercorns. Enjoy your weekend! I have to make a trip to one of our Asian markets very soon to pick up those peppercorns. Your chicken looks and sounds delicious! Thanks for the great recipe! Thanks Pam! Have a lovely weekend! This looks good. Will definitely try it – so simple with few ingredients. Thanks for sharing with us. Biren, the chicken looks & smell good! Trust me, I can smell it from here. Hahaha! Oh, do chk my latest on Amazing Kitchen Tips (Part IV) & do share with us if u’ve tried any of them! Love this recipe, Biren. Super easy and flavourful. I’ll have to try this next time. Thanks for sharing. Hope you and your family have a lovely weekend. Thanks LeQuan! Enjoy your weekend! Looks delicious! I’ll have to try this sometime soon! You are always welcomed for dinner. 🙂 I hope you find the peppercorns. As I was saying to Sonia, I often wondered why it is seldom used in Malaysia. Perhaps it is because most people use five spiced powder instead. I spotting this on FoodGawker and will say there has never been a more alluring photo of chicken taken! It jumped off the page. This sounds simply delicious and I cannot wait to try to make it myself (for real, not just sayin’ that!). YUM-mee. Thank you for this beautiful post! Wow, sichuan peppercorns have worked their magic on this awesome chicken dish. Loved your explanation and photographs! I am lucky that these are available in Hong Kong! Biren, Love the chicken with sichuan peppercorns, looks so delicious! You should submit this to the Incidental Party for Sichuan. It’s strange that I’m in an Asian country and I haven’t had szechuan pepper chicken although I had szechuan pepper in other things. It does sound like an interesting dish to make though! Biren, that looks so gorgeous. Your chicken reminded me that it’s lunch time for me. Szechuan pepper has subtle tingling sensation… My Beijing friend uses it to incorporate into his flower buns. I’ve tried them with chicken before. This is interesting. ooh !!! i am drooling looking at the pics..looks wonderful yumm!!! I use szechuan peppercorns for fish frequently, but I bet it added a lovely flavor dimension to your chicken 🙂 Very nice! I like having this kind of roasted chicken too! Must try it some day. Just received some szechuan pepper from Ann & Gert. Yay!